Getting ready for the 2013 Motoscape Rally! 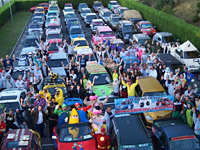 I hope everyone’s preparations are well under way for the fantastic 2013 Motoscape Banger Rally. I just thought I would share a few tips to make the event better than ever and hopefully save you time and hassle along the journey………. 1/ Should I decorate the car? It’s up to you, but there are cash prizes for the best decorated cars but more importantly the vast majority of teams do decorate their cars and it adds to the spirit of the event! Take a look at some previous banger creations!